you can see why a food blogger would think twice before cooking, eating, or posting anything at all. There are moments I’m shifty-eyed and clench-jawed just thinking of recipes that discuss things like the quality of certain cheeses or chocolates that easily set one back $25 a pound. Add to this mix the concepts revolving around our fascination with being thin and a faithful, earth-loving person begins to be more than confused. earth day ideas for earth-loving cooks–coming up April 22, 2016There are many things we can do, and you’re likely aware of quite a few, but for those of us who are comfortably set for house and home, food and clothing, we can share all we can and use all we can wisely. We can donate a few bucks a month to the local food shelter, the World Food Programme or No Kid Hungry.We can use less water, walk more, eat less meat or simply eat more plant-based foods. We can use fabric napkins and buy a couple of dozen white bar towels to use instead of quite so many paper towels. Pick a cause that speaks to you (clean water, better air quality, etc.) and write letters or emails. Study up on climate change and hunger here. Donate to the crisis in the Central African Republic (C.A.R.) here. For a list of 10 great things to do right here and now, read here. Heat a skillet over medium flame with a teaspoon of butter or olive oil. 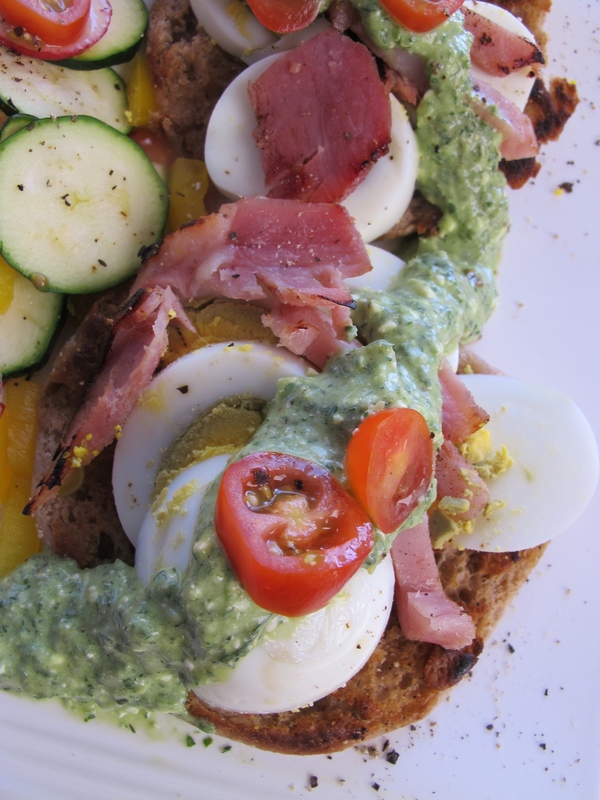 Place the halves of an English muffin in the pan facing down, along with a few thin slices or slivers of Easter ham. Let all of it cook 3-4 minutes or until everything gets a little crispy. 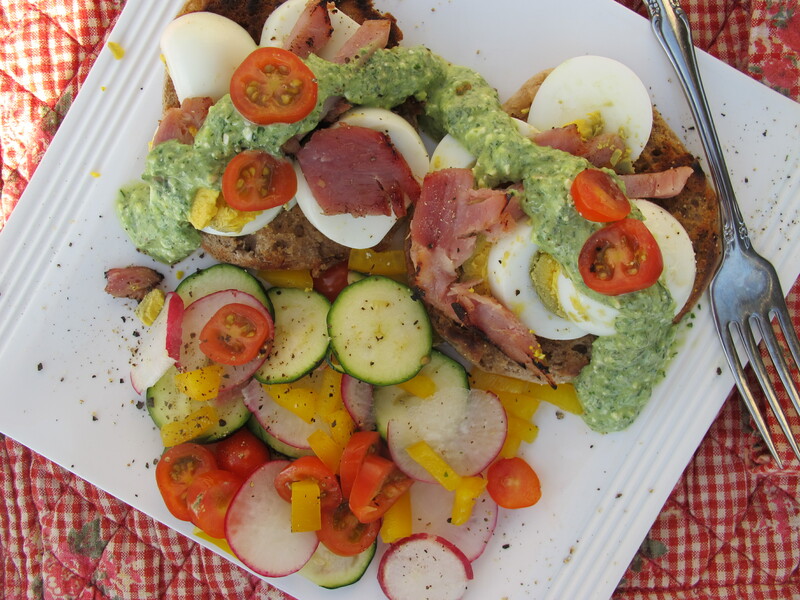 Remove muffins to a plate and top with 2 leftover boiled, peeled, and sliced Easter eggs, along with the ham. In the meantime, slice up some of the vegetables from your holiday veggie tray or salad– I liked a lot of radishes with some zucchini, yellow peppers, and cherry tomatoes–and put them on the plate. (About a cup total or however many you’d like.) Give them a few grains of salt and pepper on top and splash with a little sherry (or other) vinegar. Drizzle the sandwich and/or salad with Greek Goddess Dip (Melissa Clark– A Good Appetite @NYT) or other dressing or dip you still have in that little container in the fridge. Eat warm or at room temperature. 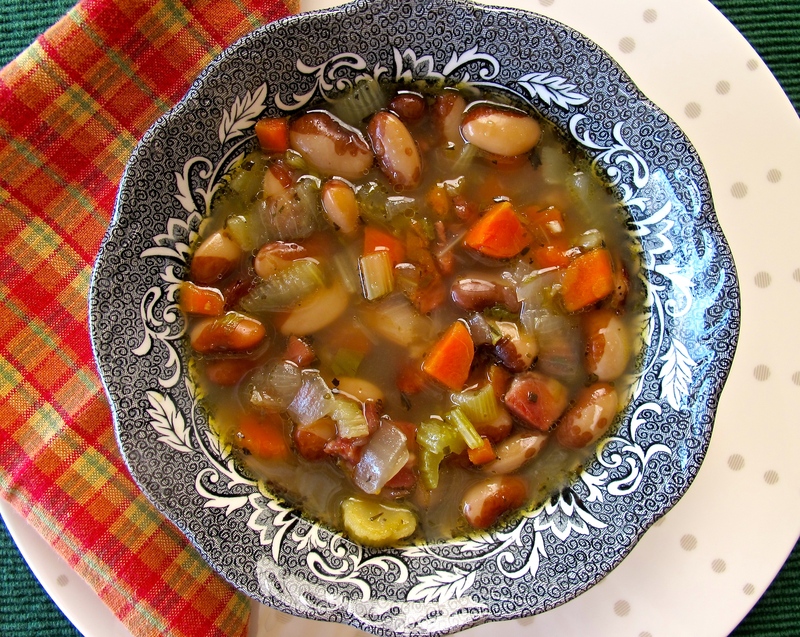 If you liked this, you might like my Snowcap Bean Soup Or Bye-Bye Easter Ham Bone.